Custom re-sealable heat seal foil bags and foil pouches for lyophilization foil pouch packaging and diagnostic test kits. • Heat seal foil bag packaging and foil pouches with re-sealable zippers that maintain a hermetic seal. Zipper medical foil pouches for ELISA plate storage will protect coated ELISA plates. Each light-proof, vapor barrier foil pouch is heat-sealable with a reclosable zipper lock. Tamper evident foil zipper pouches. Depending on vapor barrier requirements, heat seal foil pouches are constructed of materials with three to four layer laminations. Medical foil pouches have low MVTR, or moisture vapor transmission rate for long term medical packaging needs. Flat heat seal foil bags for medical device pouch packaging, zippered foil bag for packaging lyophilization products and foil pouch packaging for diagnostic test kits. Accessories like Zipper, tear notch, lip, hang hole, etc. 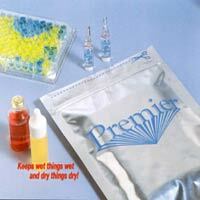 Resealable heat seal foil pouches for lyophilization products foil pouch packaging. Zipper foil bags - custom printed foil pouches and bags, and custom printed foil pouch packaging for diagnostic test kits foil pouch packaging.